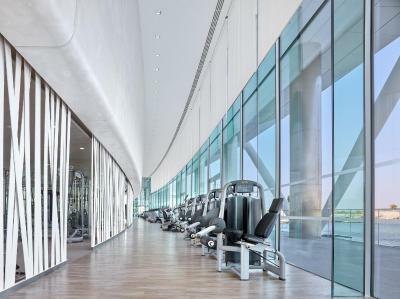 Lock in a great price for Yas Hotel, Abu Dhabi – rated 8.8 by recent guests! The hotel is just very different. Design. Fast. Location. Noises. Ferrari and other beauties. In my opinion brilliant for a weekend from nearby when visiting the parks. Or as a stopover for a night or two when visiting the Emirates and Oman. Combine with the magnificent beach hotels nearby, in Dubai or Oman. We had a deluxe room with plenty of space for our family. Love the location of the hotel. It’s beautiful with the race track on one side and the marina on the other. The staff was very helpful and courteous! Rooms were amazing! 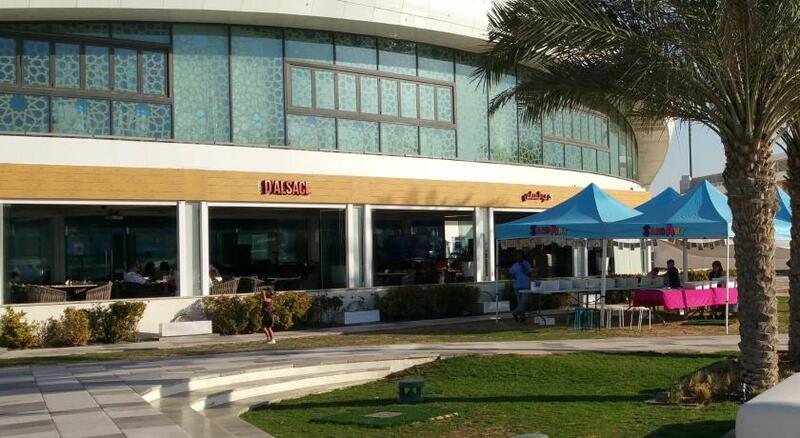 Near to yas mall, Warner Bros, Yas Waterpark and Ferrari world. The location of the hotel is nice, many restaurants, pubs and karaoke around. The rooms are clean, big, comfortable with automatic curtains, nice shower and nice decoration. Very nice hotel and location. Very futuristic architecture with tech features in the rooms. I loved the location and views ...the general atmosphere the size ..of rooms was lovely ....staff is friendly and helpful. Great breakfast. Great hotel Architectural and Interior Design. 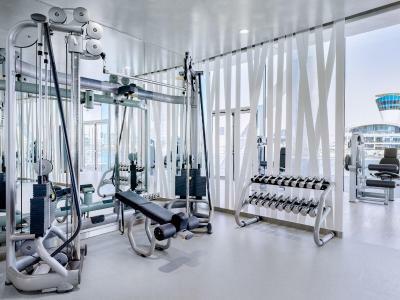 Yas Hotel, Abu Dhabi This rating is a reflection of how the property compares to the industry standard when it comes to price, facilities and services available. It's based on a self-evaluation by the property. Use this rating to help choose your stay! Yas Hotel Abu Dhabi features a unique design, set half on land and half on water. It offers multiple dining and lounge venues, modern rooms with mood lighting and free internet. It directly overlooks the Formula 1 circuit. The hotel's guests can enjoy on-site evening entertainment. 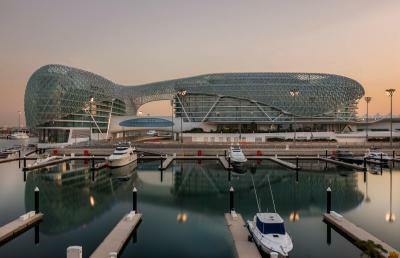 Yas Hotel Abu Dhabi is connected to mainland Abu Dhabi by a bridge and is only a 10 minutes' drive from Abu Dhabi International Airport and 15 minutes' drive from Abu Dhabi city center. An 18-hole golf course and Yas Mall are within walking distance from the hotel. 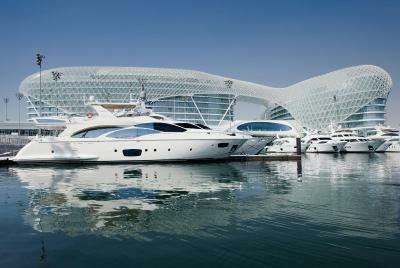 When would you like to stay at Yas Hotel, Abu Dhabi? The room is spacious with modern décor, furniture and custom fabrics. It has floor to ceiling glass windows with views. Rooms are open plan with a sitting area and feature a flat-screen TV. Located in the hotel's main tower, these spacious suites feature a state-of-the-art Home Theater system. This spacious room features modern décor. It has floor-to-ceiling glass windows with views. There is an open-plan sitting area with a flat-screen TV. This spacious suite features a modern décor. It has floor-to-ceiling glass windows with views. There is a separate living area with a flat-screen TV. This spacious suite features a modern décor. It has floor-to-ceiling glass windows with views. There is a separate living area with a flat-screen TV. Bathroom is fitted with a bath, a shower and free toiletries. This twin room has a balcony, mini-bar and sofa. 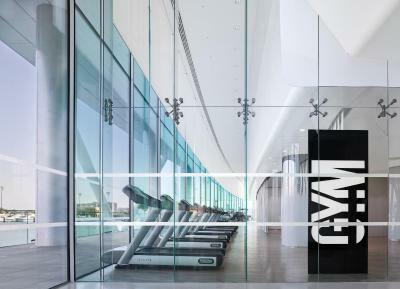 House Rules Yas Hotel, Abu Dhabi takes special requests – add in the next step! Yas Hotel, Abu Dhabi accepts these cards and reserves the right to temporarily hold an amount prior to arrival. The property will be going under some renovations in the lobby and restaurants, from 1st April until beginning of November. The renovation might affect your arrival experience and create temporary construction noise. Great location. Close to all parks (Ferrary, WB and WaterWorld). Free bus to all parks. Nice rooms, very friendly staff. Good breakfast and dinner. Yas Mall next to Ferrary Park, you can buy whatever you need from food and clothes to pharmacy. The temporary reception area is disappointing having experienced the former prior to refurbishment. Once the "W" re-branding has been completed I'm sure it will look amazing again ! The staff here are some of the best in the world without doubt. Nothing is too much trouble for anyone and service is fantastic at all times. Spacious rooms, amazing design and comfort. Loved adult pool with no kids, they have another pool. Delicious breakfast. The booking was not visible to the staff. Although I booked through booking.com but reception failed to find it. My room was giving to two customers by mistake. Imagine I was showering and another guest entered my room assuming no one inside. Reception does not pick any calls. I tried several times to call reception from room and no use. Food could be better. Only one soap in the bathroom. The hotel is slightly changing identity (Viceroy - Marriot - W) again and few staff members in restaurant not as sharp as could be but mostly excellent. Front desk top. Due to rate/value ideal for families, like us, and you simply cannot have it all. Pool area bit boring. We were opposite the night club across the marina on the first night which went on till late on Sunday. The staff were incredibly helpful and the assistant manager Maria in particular was exceptional in the way she helped us during our stay. The hotel felt special and if you’re a motor racing fan its absolutely mind blowing to be situated in the middle of the circuit with so many things going on around you each day and night including private track days watching amazing cars race around at night to more relaxing bike rides and joggers under the flood lights twice a week. The hotel location is very remote and nothing nearby; it also very noisy in the morning when the formula cars start practicing on the track and surely you can't sleep. the bathroom and WC style is not family friendly as it is very transparent and does not provide the needed privacy. The family swimming pool is very small, noisy and crowded while the adults swimming pool for 16+ only. Breakfast was good with plenty of different options.